I Really Should Start Doing This Professionally. Well, happy Monday morning, everyone! Or is that just me because I’m sitting here at my computer in my kitchen wearing shorts and a t-shirt and sipping coffee while the rest of you suckas are like dressed and working and showered and stuff? If it makes you feel any better, I worked hard for the money this weekend — so hard for the money. Except, of course, dancing is not what I was doing. I was serving food and beverages to patrons who, for the most part, are usually pretty cool, but for some reason this weekend were mostly complete asswipes who couldn’t bring themselves to tip more than 10%, which might be okay for some crummy waitress who never smiles and messes up your order and doesn’t refill your drinks, but trust me when I say I’m nothing if not great at my job and if you’re tipping me only 10%, there is seriously something wrong with you. Really. It’s not me. It’s you. Also, I’m painting my entire living room today (and most likely tomorrow because, as I’ve explained before, painting is not necessarily just a let’s-slap-some-color-on-these-walls-and-call-it-a-day type of project — it’s a meticulous, tedious, back-breaking, laborious undertaking, the likes of which I’d wish on all tight-wad tippers of these Great United States for the rest of eternity). I painted the crown molding last week, a task I’ve been putting off for four years since we painted the living room the first time without taping off the molding because we knew we’d be painting it (eventually). And unfortunately, now that the molding is all crisp and clean and white and looking brand-spankin’-new, it’s become painfully clear that the walls need repainting as well. The thing is, it really would’ve made more sense to paint the trim first (oh yeah… I still have to paint the baseboards, too) because I can do that without taping off the walls, and then I can use my awesome little short-handled brush to cut-in along the trim with the wall paint without having to tape anything off, just like I did in the office. Sure, I have to be a bit more careful while I’m “tracing” the outsides of the room, but I assure you it’s quicker (and cheaper) than applying all that tape. So why am I repainting the living room? 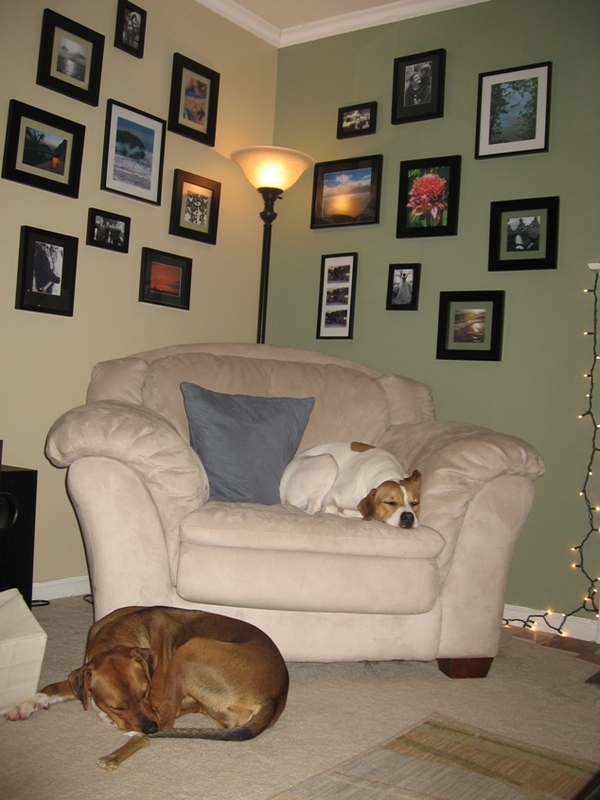 1) It was the first room we painted when we moved in, and we had no clue what we were doing. 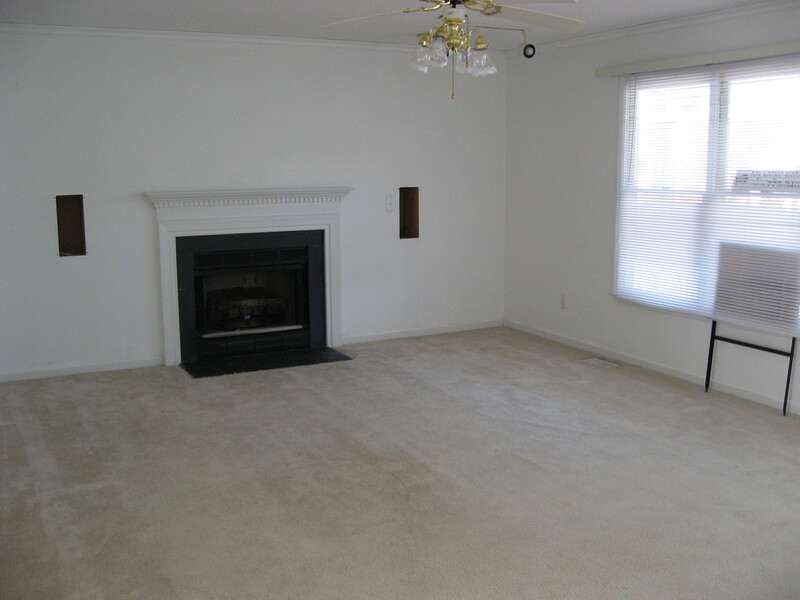 The “neutral” color we picked turned out to be pretty yellow, and while I personally loved the green accent wall around the fireplace, we realize that one day we’ll actually have to sell this place and it’s probably wise to choose something that will appeal to more buyers. Also, we originally used a semi-gloss paint, which unfortunately shows every little flaw in the walls, and that just won’t do when you live in a 17-year-old house previously occupied by renters. 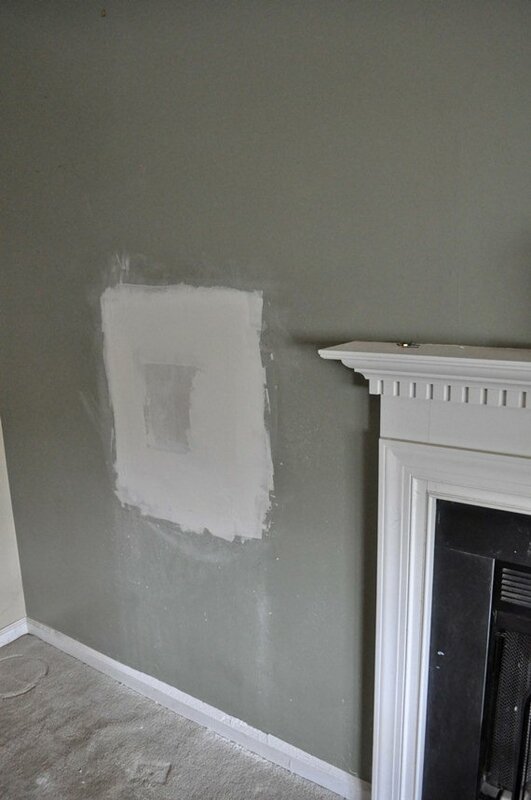 2) One of our first projects was patching up these speaker holes on either side of the fireplace, and let’s just say we didn’t do the greatest of jobs. 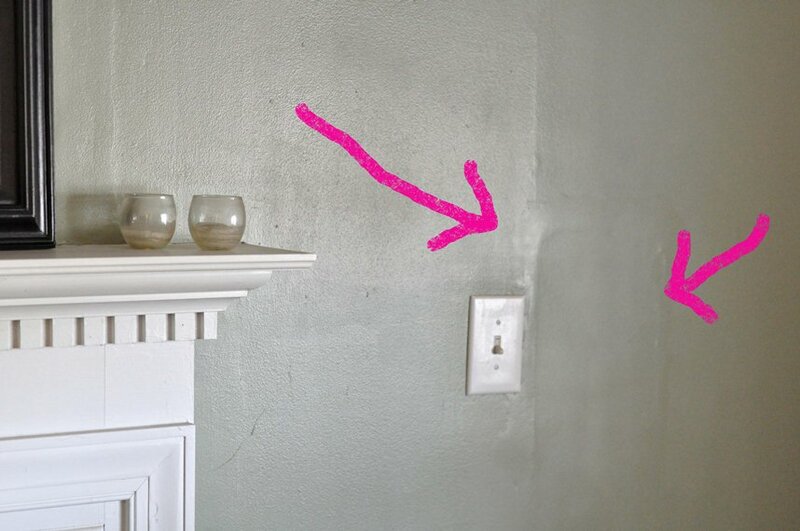 Pair a crappy patch job with semi-gloss paint, and you have one fugly wall. So recently Justin re-did the patch job, which affords the perfect opportunity to just go ahead and repaint the whole room. Oh, and our friend Matthew from Inside the Nice Guy will be arriving for a visit on Thursday, so I have T-minus 3 days to complete this project (and other guest-prep tasks) before he gets here. There’s nothing like the imminent arrival of company to motivate me for house projects. Since it’s already after 8:30 a.m. and my coffee is all gone, I should probably get started. Do you think Justin would have a problem with me removing our giant plasma t.v. from the wall by myself? Oh well. No one can say I didn’t try to get started. Thank you for reading Domestiphobia! This post might contain affiliate links. Knowing you stopped by totally validates the time I spend here, so leave a comment. Preferably a nice one. I'm also on Facebook, Twitter, and sometimes Instagram if you want to connect. I know you’d be doing these house projects anyhow, but know I could be sleeping in a room with no ceiling and it would still be awesome. Just looking forward to seeing the two of you! Wait a minute! I’ve never had mints on my pillow when I visited. I’m still in my pjs, too. At least you started off the day with good intentions. I have a pretty simple repair job in front of me, but that would mean finding my socket set or an adjustable wrench, and I don’t know if that’s going to happen today. I’ve always found that guests who are handed a cocktail upon their arrival don’t notice the dustbunnies accumulating in the corners. ;) We’re hosting my brother and a couple of friends in 2 weeks, but they’ll be in town for a bachelor party, so I’m not stressing about getting the house ready. How much will they remember anyway? Oh! I love that. Can I change my mint request to that of a nicely chilled ‘God Child’? Ugh I’m sooo sore. And I still have another coat to do! I know our guest wouldn’t mind if the house wasn’t painted, but it’s more something we have to do for resale anyway, so I may as well use the motivation to get it done. 1. you’re starting to scare me. why? 2. cus, you’re stealing my life. 3. no joke, when i say that today i am repainting my fiance’s living room in preparation for my moving there cus his house is bachelor city and we’re not even going to talk about the colors or paint choices he picked when he moved in. 4. nevermind that last point: he used FLAT paint in the bathroom. um, do you even want to know how many toothpaste dots are all over the walls????????????????????????? 5. i’m pretty sure that I’m painting it almost that exact green in the picture above. that is, of course, after i tested it yesterday and it was freaking pee green yellow, so we had to have it remixed. i hate greens. but i love them. 6. i waitressed once. i will never do it again. 1-5: That. is. crazy. Hopefully he’s at least helping you! And I miss my green. :( And flat paint in a bathroom?? Yikes. 6: Yeah… I didn’t think I’d do it beyond the age of 20, but here I am! Hooray for the little surprises life throws at you! commonly served in a rocks glass on ice. I’ve never heard of this, but for curiosity’s sake, I may have to mix one up this evening. Sounds wonderful. Crappy patch job?….that was my best drywall work ever. Okay never mind it was crappy. Hahaha… no worries – second time was a charm. ;) Thanks for your help! Providing us with your email address will allow us to send you the communications you select below. You can change your mind at any time by clicking the unsubscribe link in the footer of any email you receive from us, or by contacting us at katie@domestiphobia.net. Did You Miss Any Of These Recent Posts? Expatriating to Italy: If You Fall, It’s Nothing A Little DOCG Wine Can’t Fix. Overdue Before-and-Afters of Our Mid-Century Brick Ranch Renovations. Happy Due Date To Me. Domestiphobia contains contextual affiliate links. Sponsored posts and brand partnerships will be identified via banner at the top of each post. Domestiphobia is a participant in the Amazon Services LLC Associates Program, an affiliate advertising program designed to provide a means for us to earn fees by linking to Amazon.com and affiliated sites. Read more here.